Sometime it becomes necessary to find the exact location of point of Wi-Fi routing. It is needed for various purposes. If you want to check whether your Wi-Fi courage is hot, low or between them, it can be figured out if you know the exact position of Wi-Fi router. Before going in detail on how to find the exact location of the Wifi router, we will review the software which we will be using for finding the Wifi router location. 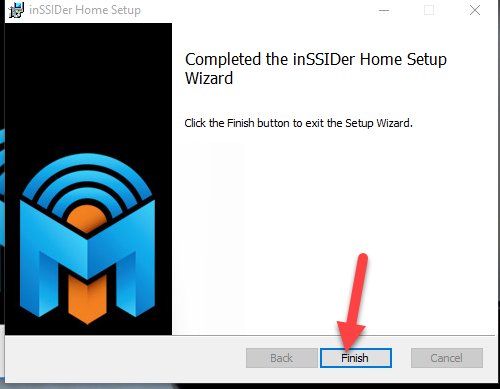 InSSIDer is a wonderful software which gives details of each Wifi connection in the user’s surrounding. It is completely free for home and non-commercial use. It can be used to optimize and troubleshoot the Wi-Fi. This is used for small organizations like home, small offices and like that. It responds quickly and helps you to figure out what is the strength of your connection. 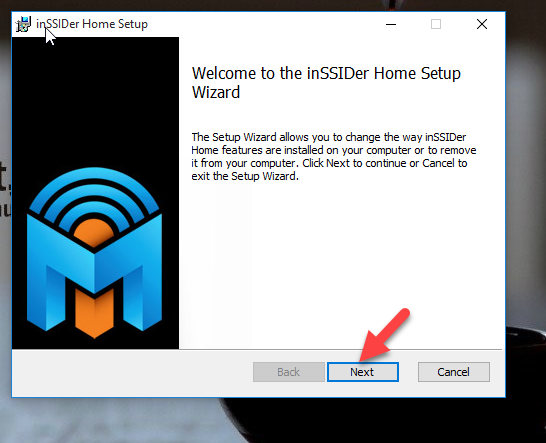 Download InSSIDer Personal for home networks. By clicking on next , you will install this software and can enjoy to find the location of your Wi-Fi points. When you open it after downloading, it will takes you into the screen where all available Wi-Fi are shown. This software is also showing you which security level your network is using , just simple click on network and the security information is visible to you. Then you will check whether it is appropriate or not. If not you can change it according to your will on the top window as shown in screen shot. 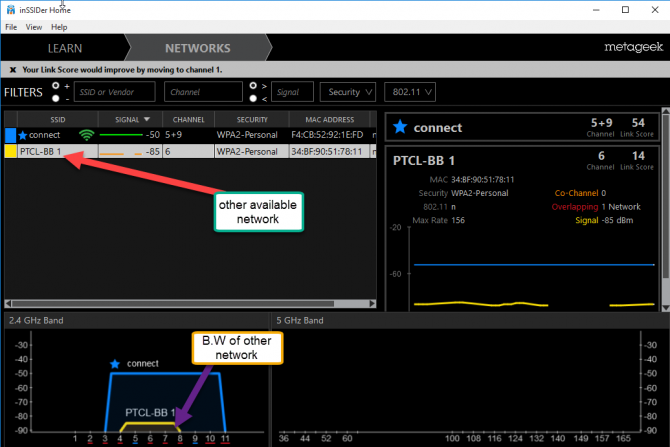 On the right side window ,you can also see all other information related to that network. And after checking all these ,you can decide which network is best for you and can provide you the best speed and fast connectivity. It measures Wi-Fi strength and estimate the overall performance of your connection. It will tell you which Wi-Fi is with better strength by comparing all present Wi-Fi and represent it by a graph. It has a concern regarding security and tell the security level of your Wi-Fi. To locate the exact location of our Wi-Fi Router we have to figure out how far away we are from router. We can find this through Signal Strength Value. If our signal strength value is low, means it is ranging from -30dBm to -70dBm it would be alright but if its go beyond from -70dBm that means strength value is going high so Wi-Fi point is going out of our range. As from below screen shot, the Wi-Fi “Connect” is having Strength value -40dBm, which means that we are somewhere near the Wi-Fi point so just move little closer so that you’ll be at exact Wi-Fi’s location. 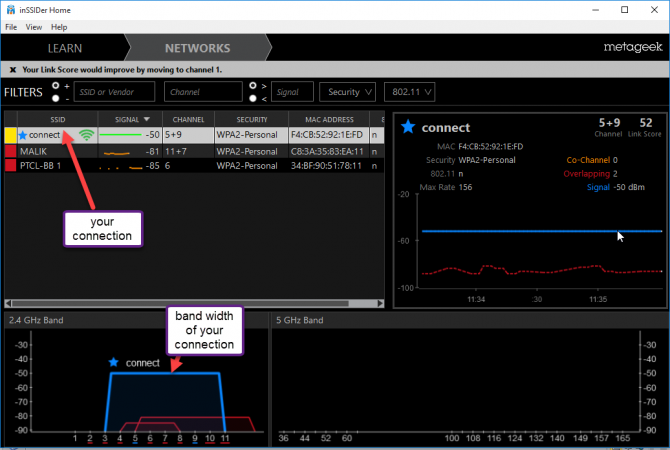 This is how you can figure out the exact Wi-Fi location through measuring the Signal Strength Value of your connection. 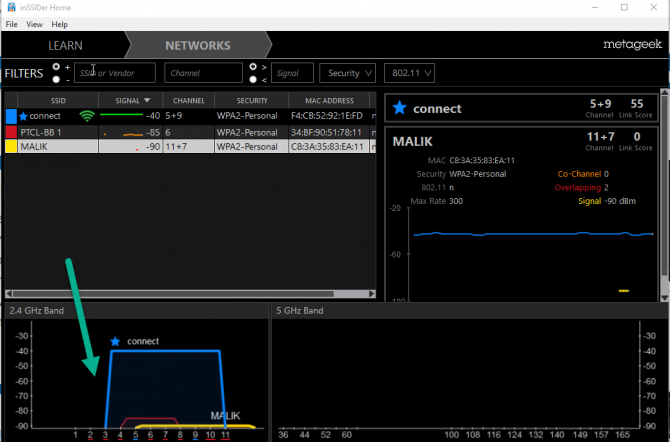 This is how you can easily figure out all access points of your Wi-Fi connection and this software can helps you a lot in making your Wi-Fi more powerful and secure. Just follow these easy steps to find the strength and performance of your Wi-Fi connection. I hope this will lead you the clear understanding of noticing the Wi-Fi access points of yours network.